We rented a storage unit when we combined households. It’s been enormously useful during renovations. We haven’t been there recently, though. She had suggested that we spend a couple of hours there this morning–taking stock, photographing items that we want to sell, and removing anything we know now that we don’t want to keep. Saturday morning arrived, rainy and cold. I really just wanted to stay in bed, but that wasn’t going to get the job done. I went to the kitchen to brew coffee and tea while she got dressed. Waiting for the kettle to boil, I looked around for something to snack on–I figured we’d have brunch later. I sliced a banana and peeled a clementine. The latter did not become part of our shared snack, though; I gobbled it down in no time flat. Seeing a partial loaf of banana bread, I had an idea and changed course. Maybe I would cook a little after all. Put a small non-stick skillet over medium heat. Toast 4 slices banana bread. Add one banana, sliced into thick rounds. Sprinkle with 2 tbsp brown sugar and 1/4 tsp vanilla extract. Toss occasionally until the sugar is melted and syrupy and the bananas are caramelized and slightly softened. Mix together 1/2 cup ricotta cheese and 1 tsp sugar. 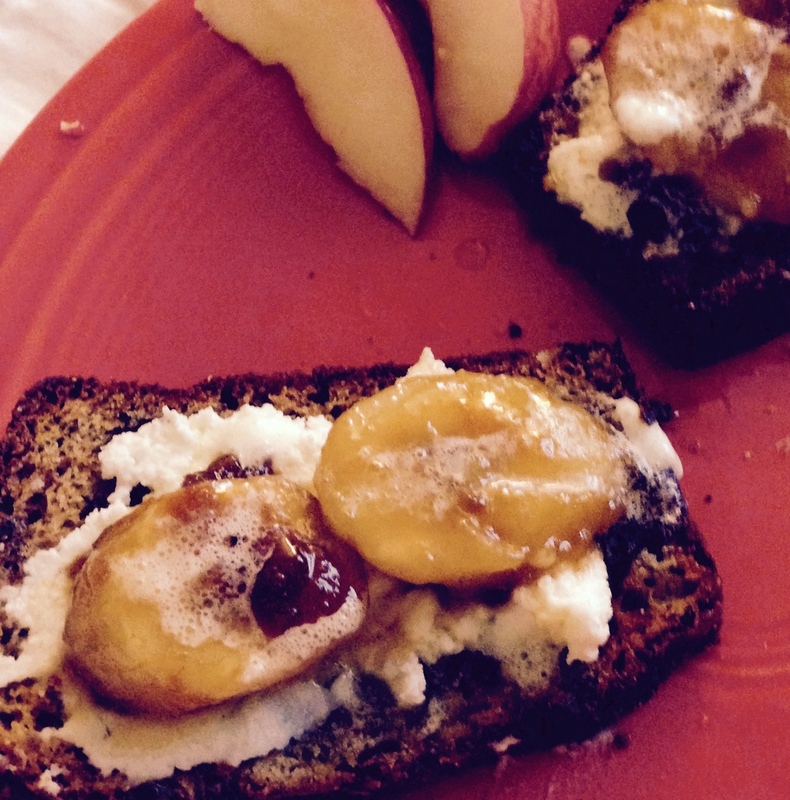 Spread sweetened cheese over the toasted banana bread. Spoon bananas over the cheese. Top, if you have some, with a little whipped cream. There are still boxes and boxes of books and CDs and files and some small pieces of furniture that we love but aren’t in current use, but the unit is well-organized now, and a trunk-load of items have been sent away. We’ll face the rest another day, but we did good work. It wasn’t such a daunting task as we’d feared–or perhaps we were just well-fortified. The sliced apples are on the plate to suggest that this was a healthy, nutritious breakfast. They are fooling no one. This entry was posted in Uncategorized and tagged Breakfast, Improvisation, Renovations, Saturday. Bookmark the permalink.